Some ‘light literature’, suggestion of a friend. This is mostly because Guénon is on the cover. “Atlantis”, you get it. Godwin searched the literature of the ages to find out what was written about Atlantis (and Lemuria). He starts with “Atlantis of the Rationalists” and deals with scholarly investigations of when and where Atlantis would have been found. This part is amusing, but not extremely interesting. Next up is the “French esoteric Tradition” with the likes of Fabre d’Olivet, Papus and Schuré. These are followed by “H.P. Blavatsky and the Early Theosophists”, “later Theosophists”, “Germanic Anthology” (mostly so-called “Ariosophists” and then we have “Two Traditionalists”, Gueénon and Evola. “The Britons” are followed by “Some Independents” (not influenced by earlier literature). The last group of Atlantic investigators are New Age channelers and spiritualists. Godwin closes with the second part of his title, the idea that the world develops in cycles. These are the four declining cycles of the Traditionalists, but there are other theories. We learn a bit about how long which cycle lasted or lasts and the (big) differences between the different theories. Of course also the end of the world is written about. A connected subject forms the end of the book “The Precession of the Equinoxes”. The book makes an alright read. 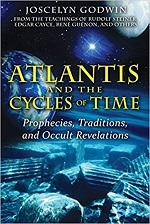 I am not so much interested in the theories about Atlantis, but the author manages to put the writers of these ideas and their theories in the perspective of their thinking and the lineage (or the lack thereof) of that thinking. This biographical information about (relatively) famous and obscure authors is what I mostly enjoyed about the book. Godwin writes with humour and critique in his always accessible style. Not a must-read, but a nice book as ‘light literature’ among other things to read.